Family Volunteer Days are designed as an opportunity for the whole family to participate in a meaningful task to make a difference in the lives of those in need. 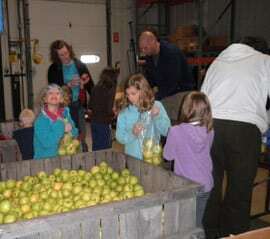 The Family Volunteer Day program is designed for families and groups with children in grades K-12. Participants will help with activities such as repacking, sorting, and labeling food that will go to help feed people in need. Family Volunteer Day will take place one Saturday a month during the school year, September through May. Shifts offered include: 9 a.m. – 11 a.m. and 11:30 a.m. – 1:30 p.m. Space is limited and volunteers must sign-up in advance by following the link below. To see available dates and to register, click the link below. For questions, please call 507-287-2350.